Undergraduate Harvard College 1973 A.B. Medical School Washington University School of Medicine 1980 M.D. Graduate Washington University School of Medicine 1980 Ph.D.
Residency Univ. of Texas, Southwestern Medical School 1982 M.D. Fellowship Harvard University 1984 Ph.D.
Dr. Chaplin completed his undergraduate education at Harvard University in 1973, then undertook graduate training in the MD/PhD program at Washington University, graduating in 1980. He completed two years of Internal Medicine Residency at U of Texas/Southwestern Medical School, Parkland Memorial Hospital. His post-doctoral research training was with Dr. J.G. 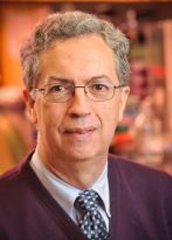 Seidman in the Department of Genetics at Harvard Medical School, studying the genetics of the murine major histocompatibility complex. In 1984, he accepted a position as Associate Investigator of the Howard Hughes Medical Institute and Assistant Professor of Medicine, Molecular Microbiology, and Genetics at Washington University in St. Louis. He was promoted to Associate Professor in 1992, and Professor in 1995. He was Director of the Division of Allergy and Immunology from 1994-2001. In July 2001, he joined the faculty of UAB as Charles H. McCauley Professor and Chairman of the Department of Microbiology. Dr. Chaplin’s laboratory aims to define the ways innate immune stimuli modulate allergic inflammatory responses that are manifest in tissues through the action of the adaptive immune response. He has a special interest in the ways commensal and pathogenic microbes that are present in the lung alter allergic inflammatory responses such as those that underlie asthmatic inflammation. He is testing the hypothesis that airway microbes impact the quality and quantity of asthmatic inflammation largely through their induction of myeloid-derived regulatory cells (MDRC). Lung and airway MDRC, defined by Dr. Chaplin’s laboratory in 2011, constitute several discrete populations of cells that determine the overall inflammatory tone in the tissues through their production of cytokines, chemokines, and reactive nitrogen and oxygen free radical species. Dr. Chaplin’s laboratory demonstrated in studies using a mouse model that superoxide-producing MDRC dramatically accentuate airway hyperresponsiveness after exposure to aerosolized antigen. In contrast, populations of nitric oxide-producing MDRC blunt airway hyperresponsiveness, suggesting that the nitric oxide/superoxide axis may be a valuable target for future development of novel anti-asthmatic therapeutics.